Selover Library Director Suzi Lyle and board members Andi Vuckovich, Anna Mahan, Joyce Ray and Pat Ebersole were on hand to accept the check from Rockwell and Krista Bonecutter. 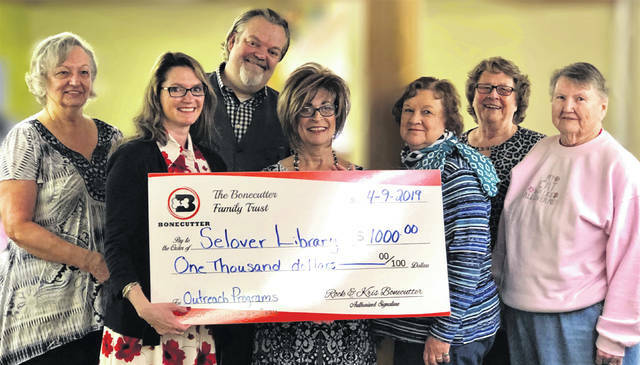 CHESTERVILLE —The Selover Library received a $1000 donation from the Bonecutter Family at the 55 and over luncheon on April 9 as part of the Bonecutters monthly Charitable Giving Campaign. The Bonecutters award a $1,000 donation every month, through the Bonecutter Family Trust, to a group or organization in Morrow County. “We wanted to give to different organizations in Morrow County, especially in Chesterville, that don’t always get the attention that larger organizations receive, including those that do not fall under the 501(c)(3) non-profit tax deductible category such as the nursing home, and in this case the library, that still need the money. It is our pleasure to give to Selover Library who does an excellent job at providing services and educational seminars involving the community.” Rockwell said. Following the presentation of the check, the Bonecutters gave an update on the Rock’s Edge Development to be located at the 95/I71 interchange to the almost 30 residents in attendance at the luncheon. “It’s been about two and half years in the making and we have experienced our ups and downs, the most frustrating aspect of a project like this are the governmental hurdles that we have encountered. Simple services like sewer and water can be three times the cost of surrounding counties. That needs to change if we want to attract development and if we hope to make it affordable. This is an issue I have been passionate about with our commissioners. The first phase of the development will be two apartment buildings with 16 units each and a retail center. They plan to break ground in May. The retail center is virtually all rented out, with an ice cream shop, a pizza restaurant, a hairdresser, Bonecutter Properties will have office space there, and a real estate office. The Bonecutters shared the latest map of the development. “If you look at the development map, all of the yellow area is reserved for light manufacturing similar to what we have with LSI. In addition to the streets there will be asphalt paths for walking, golf carts etc. The intention is to create an environment where people can walk to work, walk to go out to eat, and walk to get a haircut or other services. We want to be able to offer the apartments, one- and two-bedroom units, at an affordable cost of approximately $650 to $700 a month,” he said.